Thanks to a generous donation of nearly $10,000 from the Allen Tate Companies, 46 rising sixth graders at Greenville Early College (GEC) will have enhanced opportunities during a summer camp at Furman University the week of August 3-7. 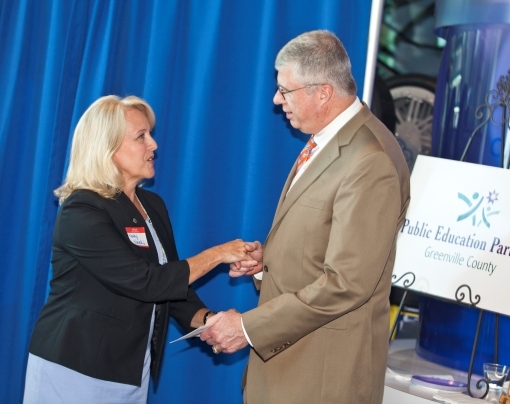 Kathy Weeks, Allen Tate RVP Upstate, presents a check to Greenville County Schools Superintendent W. Burke Royster. The Rising Sixth Grade Summer Camp, serving students from six middle schools, will familiarize students with their new peers, teachers and other school and district staff and ease the transition from elementary to middle school. Students will learn about GEC expectations and daily procedures and will participate in many team-building, testing, and technology-rich activities throughout the week. The donation from Allen Tate, the Carolinas’ leading real estate company, will be used to purchase backpacks for each student, along with school supplies, school t-shirts, books, daily lunch and drinks. Allen Tate is the sole corporate sponsor of the camp. “We are extremely pleased to sponsor the Greenville Early College summer camp. The Allen Tate Companies are passionate about public education and understand its critical importance to families making home-buying and relocation decisions,” said Kathy Weeks, Allen Tate regional vice president, Upstate. Greenville Early College serves students in grades 6 through 8 with a focus on literacy, mathematics, and critical thinking skills, and the opportunity to enroll in dual credit classes once in high school. Beginning this fall, The New Tech program will utilize a project-based learning approach to engage students in a dynamic, rigorous curriculum to solve complex, real-world problems through collaboration, critical thinking and creativity. Greenville Early College students have multiple opportunities to visit college campuses to explore enrichment and academic activities. Upon successfully graduating from Greenville Early College, students will have the opportunity to apply to Clemson University, Furman University, USC Upstate, and other colleges and universities. The company’s contribution is part of more than $23,000 raised in the Upstate as part the 17th Annual Allen Tate FUNday, a series of regional events held each fall where Realtors and company vendors “pay to play” and raise money for local public education organizations. To date, FUNday has raised more than $1.52 million for public education across the Carolinas.